I’ve been fortunate to make a 3rd cousin connection on my Jones/Kelly line who I share quite a bit of DNA with. This cousin helps me divide my DNA matches into my maternal maternal column. Even still, it’s been difficult making sense of how I relate to my other matches. I have a small group that match me on a sequence on chromosome 21 and I’m getting a little closer to figuring out how we are related. What’s so important about the sequence on chromosome 21? It’s a sequence I share with my Jones cousin, TK. He is a known 3rd cousin. I share the same sequence with a handful of other people. Because TK shares this sequence with me, I know that those people come from my maternal grandmother’s side of the tree. These are the people who match me on GEDMatch.com. We are related but how? But, which line? Which country, for that matter? My maternal grandmother’s grandparents were from Ireland, Wales, Australia, and England. I’ve been working with a woman I’ll refer to as MP. MP shares this sequence with my known cousin, TK, and myself.. In looking through my DNA connections on this sequence, I found that MP and AB also match on this sequence. Their relationship is estimated to be in the 3rd cousin range–much closer than our estimated 5th cousin connection. Through comparing family trees, they’ve found their common ancestors on their Calcutt/Taylor line. This is the connection my matches (viewable on Wikitree). I don’t have either of these surnames. However, since we all share this sequence, I can narrow down who might be our common ancestor. This line starts in Canada but originates in England. 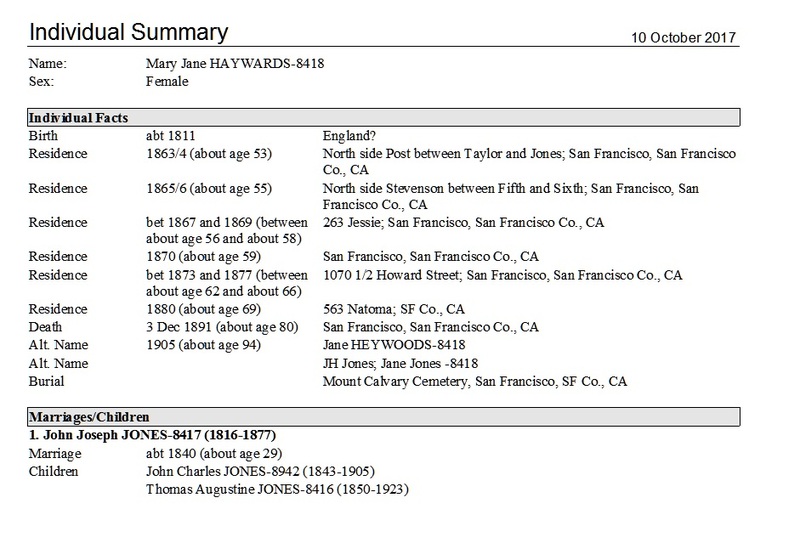 I only have one ancestor on this side of the tree who came from England: Mary Jane Haywards (aka Hayward, Heywood). Mary Jane was born in England around 1811. It’s most likely she fits into the Calcutt-Taylor genealogy somewhere. But where? Where???? What Does This Tell Me About My Own Family Tree? I don’t know who the common ancestor is between TK, MP, AB, and myself. I’ve contacted another DNA connection, ZC, who also has this sequence, too. She has narrowed down our connection to her paternal line which originates in England. Mary Jane (Haywards) Jones was born in England but migrated to Australia. She married John Joseph Jones, a native of Wales. Below is a brief summary of what I know about Mary Jane. They had two sons both born in Australia: John Charles Jones born in 1843 and Thomas Augustine Jones born in 1850. Around 1857, the family left Australia for California. They settled in San Francisco. I am really not sure what to do next. I now have an ancestor and a country. I know that the connection is with the Calcutt and Taylor line. I have a possible village from AB’s research. Having multiple migrations makes things difficult. The records that would tell Mary Jane’s story in San Francisco were destroyed in the 1906 earthquake and fire. I have to look towards Australia for clues. Was Mary Jane in Australia long enough to leave a paper trail? I could start in the village where AB’s ancestors lived in hopes I luck out. Hey, it happens sometimes with genealogy! If Hayward is a common surname in this village, I might not be able to pinpoint the correct Mary Jane. I’ll keep contacting people who have this sequence on chromosome 21. Maybe I’ll find someone with Haywards that will provide the missing details. I’ll continue to research. If the genealogy gods are smiling on me, the records I need still exist. The DNA is showing me the approximate line and place, but it’s going to take research to figure it out.